So, we have a small collection of wind-up toys. They are one of our favorite ways to play. 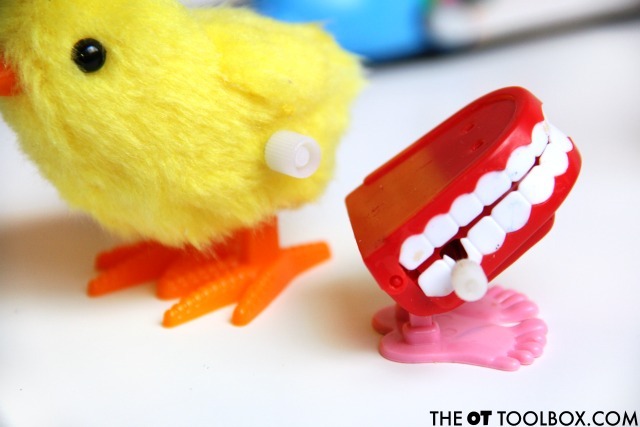 There is just something about a chattereing set of teeth that walk that makes a kid smile. When you add in the fine motor benefits of playing with wind-up toys, it's a big bonus to those smiles! 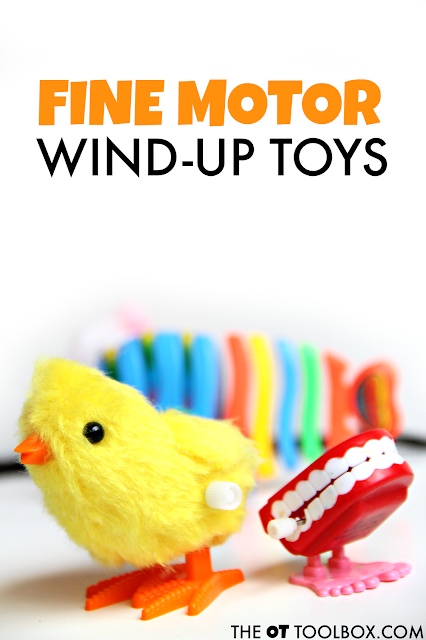 Grab a few wind-up toys and start building fine motor skills. For more ways to build fine motor skills, try this in-hand manipulation puzzle. 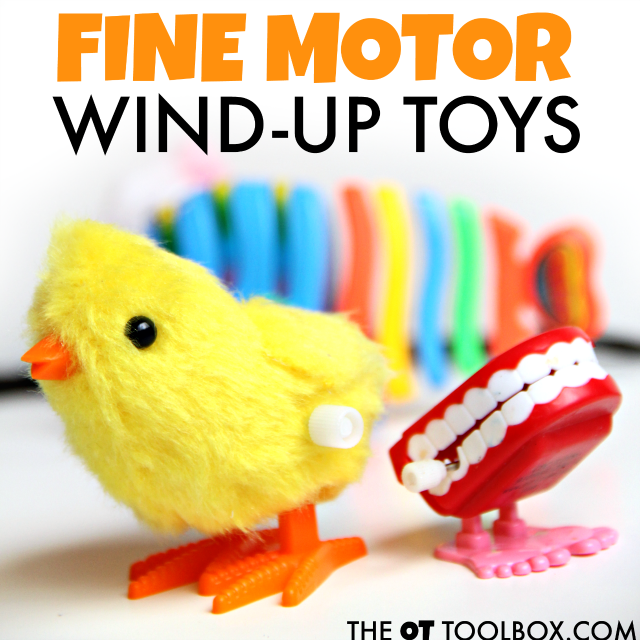 Wind-up toys are a great way to build fine motor skills. In order to make the toys go, you need to wind a small knob on the side of the toy. This skill is one type of in-hand manipulation called rotation that is needed for skills like turning a pencil with the tips of your finger. Read more about the types of in-hand manipulation here. 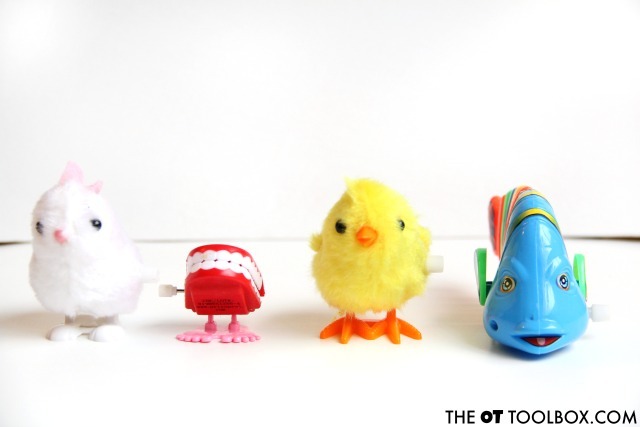 You can use wind-up toys for a fine motor activity by using several different toys. These are perfect little toys to add to Easter baskets or birthday gifts for kids. Ours are a collection that we have had for a couple of years now, but there are so many available out there. These little Spring bunnies and chicks are perfect for the fine motor activity we did. This activity is so easy and a great way to work on in-hand manipulation and bilateral coordination skills. Line up a few strands of yard or shoe laces on a table. Place one wind-up toy in each lane and have a race! It's a fun way to encourage fine motor strengthening. 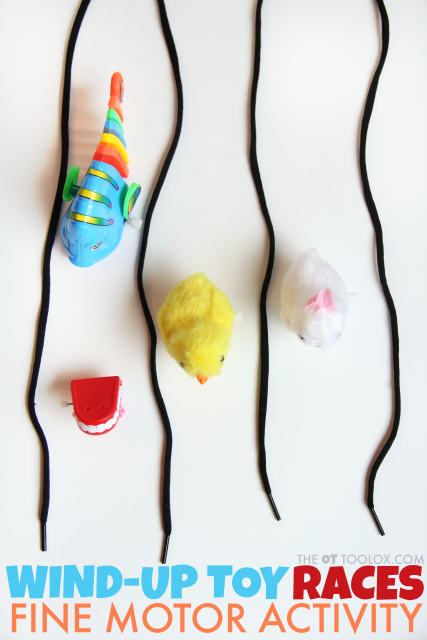 Following the moving wind-up toys is an activity to develop and strengthen visual tracking, too. 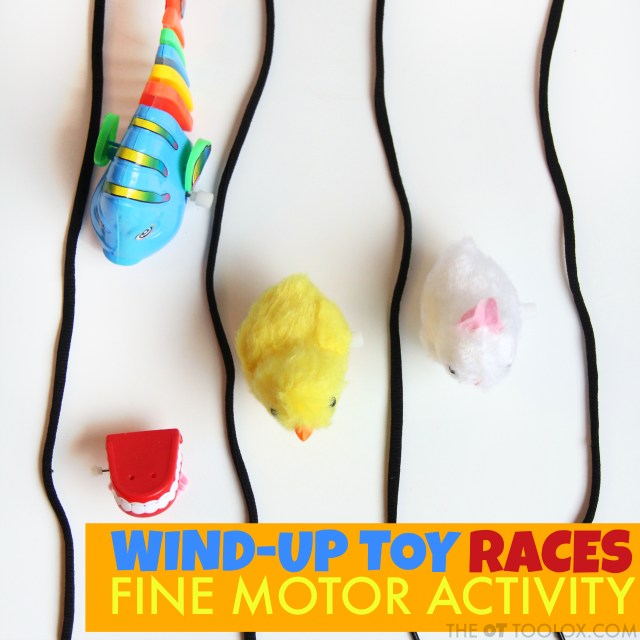 Kids will love to have races over and over again with this wind-up toy fine motor activity!